pricing structure should be simple. So Reliance Jio won’t charge for voice calls, data prices will be what Ambani calls the “cheapest in the world” and there will be just 10 tariff plans to choose from. To start with Reliance Jio data packs will start for as low as 5 paise per MB adding up to Rs 50 for 1GB, a fraction of the cheapest data plan in India at the moment. Reliance Jio will offer data packs ranging from Small (S) to XXXL. The small plan starts at Rs 149 for 0.3GB data along with access to 100 SMSes. There’s a Rs 499 Medium pack which comes at Rs 499 for 4GB 4G data and access to unlimited 4G at night. 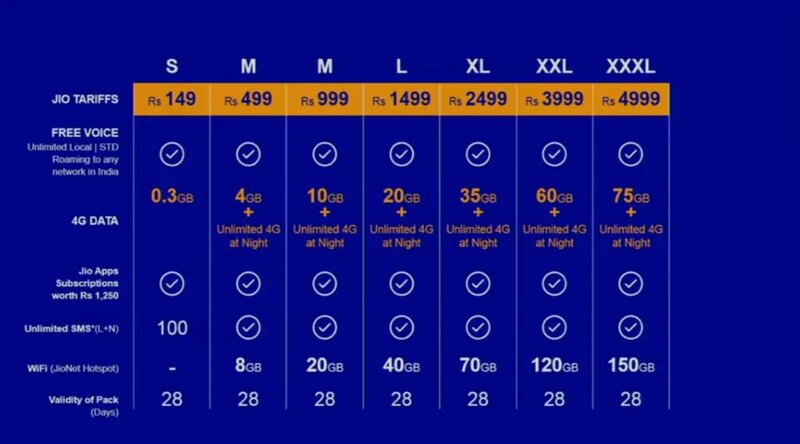 The Large, XL, XXL and XXXL 4G packs are priced at Rs 999, Rs 1,499, Rs 2,499, Rs 3,999 and Rs 4,999, respectively. The Reliance Jio data packs give users an access to free voice calls. The Reliance Jio data packs give users an access to free voice calls and Jio premium apps. Jio Premium apps include JioPlay, JioOnDemand, JioBeats, JioMags, JioXpressNews, JioDrive, JioSecurity and JioMoney. Reliance Jio data packs with access to Jio premium apps is free till December 31, 2017. Users will be charged as per these data packs after December 31. All data services will free till December 31, 2016 after which users will be able to choose their tariff plan. The free services will start September 5, he said, though they have been free for all users for a few months now. Ambani called it the Jio welcome offer, the best anyone was offered anywhere in the world.